It is now becoming common knowledge that Restore Infusion Therapy® is the most effective and rapid ketamine based treatment available for chronic migraines and fibromyalgia. Even the major drug companies like Allergan and Johnson & Johnson are stopping research into older antidepressants and rushing into the development of new drugs that they hope will duplicate the benefits of Restore. The Restore Infusion is the next generation of rapid, stronger and longer lasting ketamine based therapy. We have over 15 years of experience with use and development of advanced ketamine infusions and have pioneered programs at major academic institutions such as Yale University. See how Restore is transforming the way we approach these serious conditions. To begin, Restore is individually formulated to your specific needs and is 3 times stronger than other ketamine infusions which rapidly accelerates your recovery. 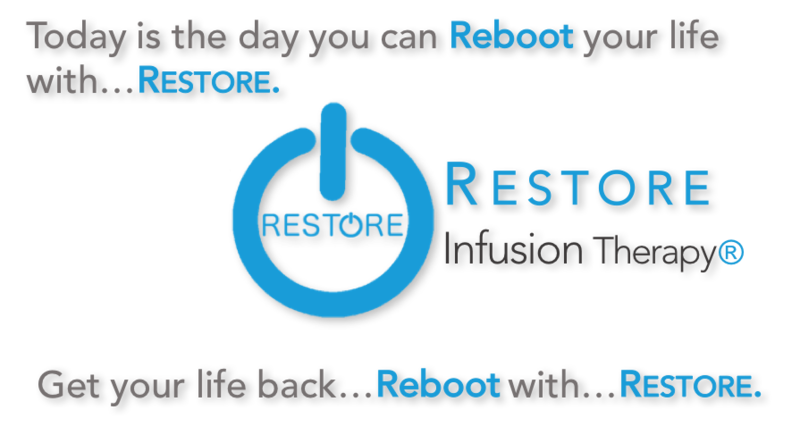 Secondly, Restore is longer lasting and can last up to 3 times longer than other infusions. This means that you need fewer infusions to start getting fast, long lasting relief. Other ketamine infusions require as many as 6 to 8 infusions over 2 weeks to work. Better yet, because relief lasts so long with Restore, you may only need 1 or 2 maintenance infusions to keep feeling great all year long. Other ketamine infusions require you to have "boosters" every month to maintain the effect. Best of all, we schedule convenient weekend hours. Arrive on Friday and be back at home or work feeling great on Monday morning! The Restore Infusion is clinically proven to provide rapid improvement from chronic pain and moderate to severe depression. But more than that, the Restore Infusion has been found to be remarkably effective for treating other conditions such as Fibromyalgia, Anxiety, PTSD, Migraines and more! Relief can begin in as little as 30 minutes following the first Restore infusion. It should really come as no surprise because we have recently discovered that all of these conditions share the same neural pathways that the ketamine molecule targets. Is RESTORE Infusion Therapy® right for me? If you suffer from depression, anxiety, migraines or fibromyalgia and have not had relief with prescription medication or other traditional approaches, then RESTORE Infusion therapy® may be an option for you. Call us today for a free confidential consultation and get started with RESTORE. The Ketamine Institute has over 15 years experience in the use and development of ketamine infusions. We have pioneered ketamine infusion programs at major academic and government institutions and are leading the way in the field of ketamine infusion therapy with our new Restore Ketamine Infusion. We’re on a mission to accelerate the health care revolution. We have developed the new Restore infusion therapy, bringing the latest breakthrough discoveries about ketamine out of the research lab and into our Restore infusion centers. Consult with our experienced team to determine if Restore is right for you. Call us today or submit this form request for a confidential consultation.